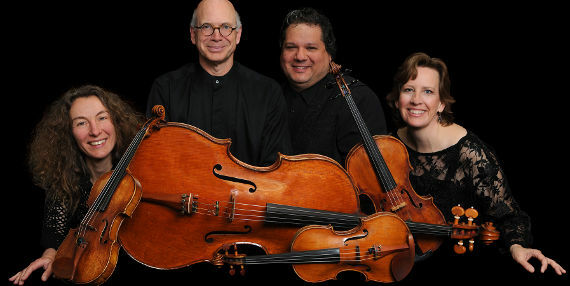 The DaPonte String Quartet returns to the Meetinghouse! Join us as Maine’s premier string quartet joins us for our next Classical on the Cove concert. As we did with their visit last summer, we will offer an optional dinner before the show so come make a winter night of it! Dinner service begins at 6 to leave plenty of time to eat before the show at 7:30. Dinner is downstairs and the concert will be upstairs. Wine, beer and other refreshments will be available. Ever since the invention of the string quartet genre during the eighteenth century, composers have explored questions of musical form. Haydn, Shostakovich and Bartók occasionally worked with cyclical ideas, writing music that ends just as it began, after ranging far afield. This oddly satisfying literary and musical concept closely mirrors many ancient heroic epics, like the Iliad or Beowulf, and innumerable children’s stories. The DaPonte String Quartet presents three of the finest musical examples of this concept. Show admission is $25 online or at the door. Dinner is $29 additional and must be reserved in advance with your concert ticket!